Don't even know why but I have never been a big Ninja Turtles fan. Perhaps it was because of the concept. Perhaps it was because all of the turtles always looked alike to me. Perhaps it was because I have never really been into martial arts. Perhaps it was because the show only made me hungry for pizza or perhaps I just don't like turtles in general. But whatever was the case, this movie couldn't change me mind about it! Now, I have to be fair though; this movie really isn't terrible. It's perfectly watchable to be honest but I can't really see why this had to be a big theatrical release. I would have been perfectly fine and content with this being a two parter, as part of a long running animated television series but as a full length movie, this is a bit too simple and a far from special movie, that really isn't doing anything new or impressive. I think that the biggest problem with this movie is that it's taking itself far too serious. 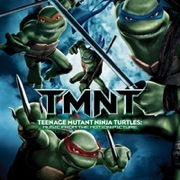 Instead of just simply having fun with the project, the movie is also featuring a serious main plot line in it, in which the turtles, for whatever reason, are trying to come to terms with themselves and each other. Annoying aspect about this story also is the continued feud between Leonardo and Raphael. Now, what is annoying about is that you just KNOW that they will start to come together again at some point and make up. So instead of being something tense or heartfelt, it's something tedious and extremely pointless and distracting. But also the main story itself feels quite flawed. It feels flawed because nothing ever gets properly explained or set up. So for some reason a guy, who for some reason have been given eternal life, needs to find 12 monsters, that for some reason have been unleashed on Earth, in order to lift his 'curse'. It just never made any sense to me and the way it all gets set up is extremely simplistic and lazy to be frank. Another thing that just never made any sense to me was why the turtles would ever take on a human sidekick in this movie. I mean, we all know that the turtles have special powers, so what could a normal, average, human being ever add to their team? It's not like they ever needed him for anything special so what was the point really? I know the character is part of the 'Teenage Mutant Ninja Turtles' universe and franchise but he adds absolutely nothing to this movie and is his presence is utterly pointless in it. The animations always looked bad and lame to me, yes even way back in 2007 already. And indeed, this really isn't a very impressive looking movie, animation-wise. It has a sort of cheap and unfinished look to it and all of the characters movements seem far from seamless and natural. I think I definitely would have preferred this movie if it simply was a classic hand drawn animated cartoon, or a live action movie, with only CGI being used for the turtle- and some of the other outlandish characters, rather than being an entirely CG animated movie. But really, this movie is still entertaining enough to watch, no matter how stupid and simplistic it gets at times. There is still some nice action and I liked some of the character design, despite the movie its 'cheap' look. I also looked some of the voice acting in this, mainly Patrick Stewart as the movie its 'villain'. So perhaps it's not as bad as some people are making it out to be, though at the same time, it's still far from a great or impressive and original movie really.